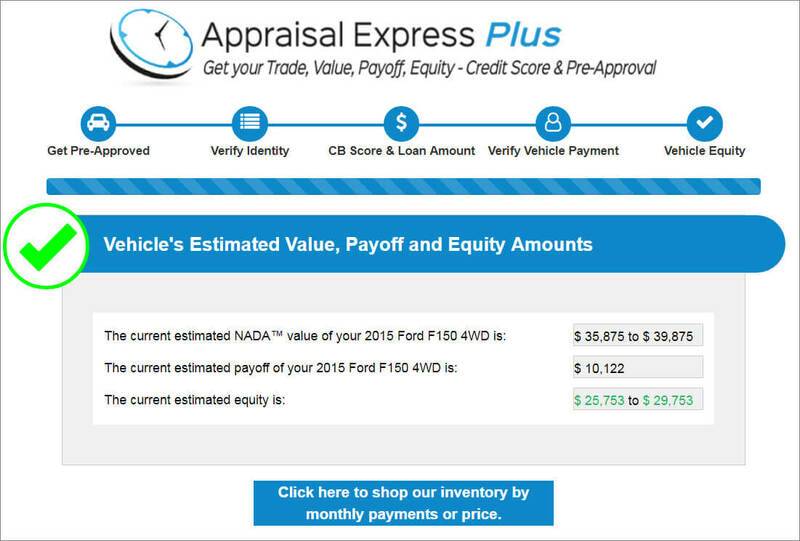 Appraisal Express Plus is a great online trade-in evaluation tool for your dealership’s website PLUS much more! 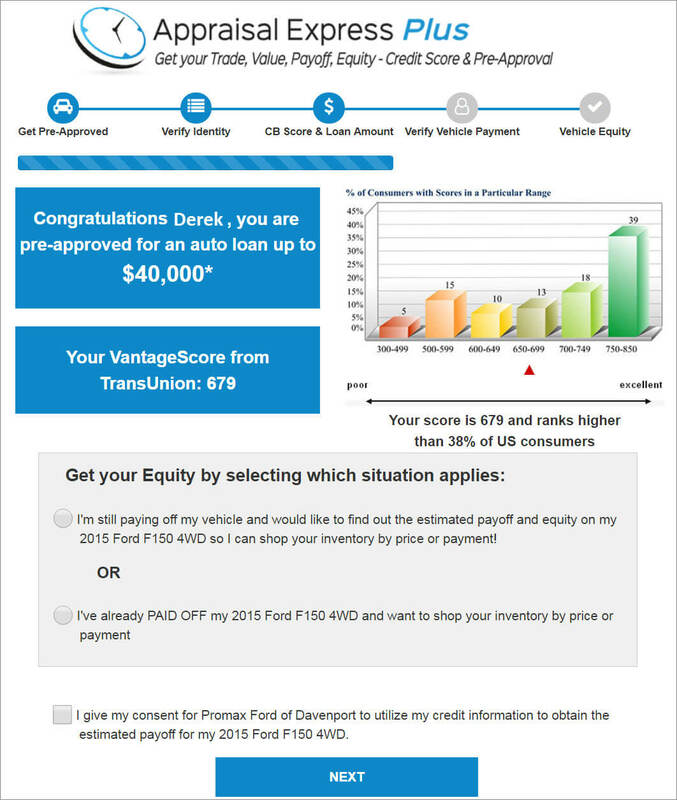 In addition to your customers getting their trade-in value they also receive their payoff and equity along with the ability to instantly get pre-approved and see their exact credit score. You get a high quality lead in return! Studies show that most car buyers check the value of their trade-in before purchasing AND that most buyers don’t know their credit score. Directly from your website with Appraisal Express Plus, buyers can instantly get the value of their trade, their payoff, and their equity. They can also get pre-approved and see their exact credit score…all FOR FREE and without having to provide their social security number. Combining the best features of our products Appraisal Express and the Instant Auto Credit App, Appraisal Express Plus uses NADA values and soft pull technology to take consumers through the initial steps of the buying process in a setting where they are most comfortable- from their home computer or any mobile device. Buyers will appreciate the convenience and the valuable information you provide; you will appreciate the increase in the quantity and quality of your leads. Appraisal Express Plus enables you to not only increase your leads, but to work those leads the right way right from the beginning. 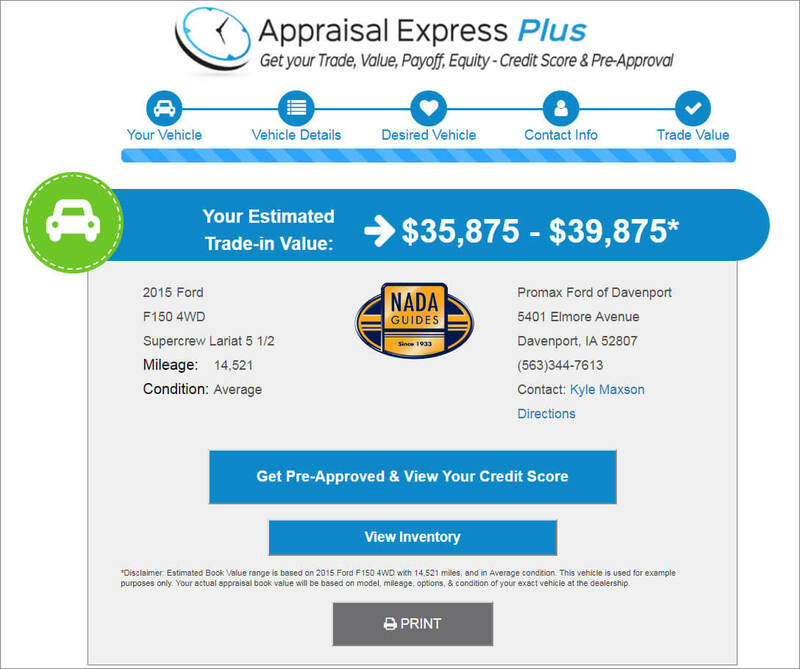 Appraisal Express Plus is a great tool that makes buying a car faster, easier, and more beneficial for everybody. Provide your website visitors with not one BUT TWO great services they are looking for, and increase your leads at the same time! Appraisal Express Plus integrates seamlessly with any website and the leads can be delivered to any CRM.